My initial title was going to be whales are eating plastic and dying, but I thought it was a little too intense. It's TRUE though and it deeply saddens me. Humans are buying and discarding so much plastic it ends up in the ocean, even if you don't live near the water plastic is making it's way there. 80% of plastic leaks from land based sources and the Great Lakes in Canada is known for contributing to plastic waste in the Atlantic Ocean. The whales can't tell the difference between krill and plastic so they eat the plastic and then their digestive system can become blocked and they can't eat, causing them to die. We toss our plastic (and compostables) and we think it just goes away. We don't think twice about it and that is not ok. We are smarter than this! After plastic free July, I decided to watch the documentary A Plastic Ocean on Netflix. I teared up watching this because us humans are doing this to innocent marine life. They show the crew going down to the ocean's floor and they find parachutes and tons of plastic rubbish that the marine life eats. Plastic doesn't actually break down, it breaks up... then ends up into our food chain. Plastic absorbs chemicals that are free floating in our ocean then humans eat the fatty tissue of marine life which stores toxins from plastic. It's a cycle and one that makes me want to avoid that wild salmon I was craving last month. When eating shellfish you're more likely to be eating plastic as you eat the entire animal. Marine life aren't the only ones impacted though, sea birds pick up the plastic in the ocean and feed it to their young. I cried when a scientist, Dr Jennifer Lavers, gets a young bird to vomit because it was full of oil and chunks of plastic. I saw no real food... just plastic. They then opened a bird up and counted how much plastic was inside a chick that passed. The record is 276 pieces of plastic in one 90 day old chick, 15% of the bird's body mass. 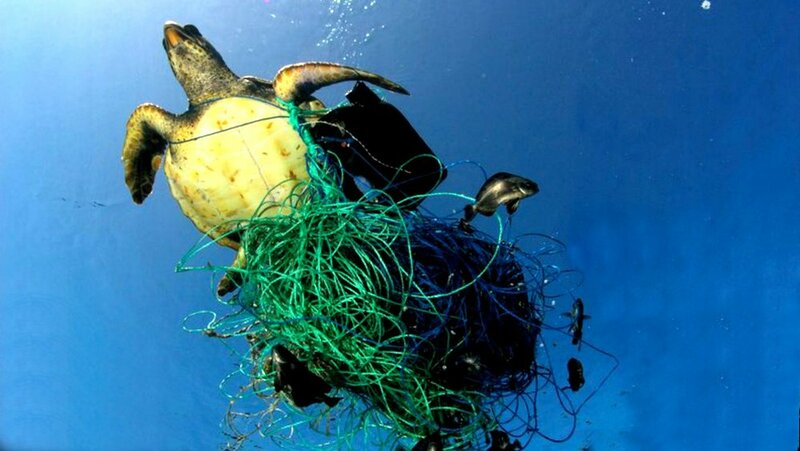 Did you know there are 5 trillion pieces of plastic afloat in the ocean world wide? It's true. In the film, they visit a town that burns plastic to cook their meals as it's cheaper than kerosene. The lady describes that her eyes burn, she has a hard time breathing, she coughs and gets headaches. All from the toxins in plastic. A scientist then comes and does a fancy test and shows the different filters when using wood smoke versus plastic smoke. The plastic smoke filter is black which then goes into the lungs, the wood smoke is very light brown. Phthalates are chemicals used to make plastic durable, flexible and soft and they are TOXIC. These are endocrine disrupters meaning they act like our hormones and interfere with body processes. There is a connection to causing breast cancer, developmental issues, decreased fertility, excess weight and asthma. Note: You need ideal conditions for compostable and biodegradable plastic to break down and that often doesn't exist, which means it takes centuries to break down in our oceans. HOW DID PLASTIC FREE JULY GO? I could make all of those, but, I just don't have the energy anymore so I avoided them for July. I really missed them too. Aside from those, I found the produce ok to navigate. Instead of choosing a clamshell of arugula or baby kale, I chose fresh heads of lettuce. I bought broccoli from Whole Foods in paper bags and used my reusable mesh bags for nuts. I stopped making matcha with almond milk and fell back in love with the traditional way of drinking matcha using hot water. I am lucky Vancouver has a no waste grocery store and a local kitchen/beauty store. I found buying cleaning products easier as I've been buying natural for years and those are usually the companies that will come out with something in glass before the toxic filled lines. I bought Nellies laundry and dish detergent that comes in a tin. Did I pay way more? Yes, but I felt good doing it. I definitely did use some plastic though! I accidentally bought organic berries that came in plastic. I used dog poo bags on days where Zoey didn't do her business deep in the forest. I was sent packages and food samples by local companies and half the deliveries contained plastic. Cheers to the companies that didn't: Pranin Organic. I went camping during plastic free july which was very difficult to execute as convenience kind of takes over. My hope is parents, schools, the media, big and small businesses, governments and my friends/family talk about this more so we can make change. We have the power to make shifts, the question is, do you care enough? We are lucky to be alive, to be living on this beautiful earth. Think of your grandkids and the animals. I want to reduce my plastic consumption to avoid extra toxins for health reasons, my future kids (manifesting! ), other's health (especially in countries without government regulations and plastic collection) and all the animals and marine life that are impacted by this. Please consider bringing your own mason jar to avoid that plastic juice cup, say no to straws, bring your tea/coffee reusable mug and avoid buying bottles water in Canada. If you go for a coffee daily, then you know you will be getting a plastic lid and a waxy paper cup, so I invite you to plan ahead. There is no such thing as perfection. I just want us to be more mindful when making every day decisions as drastically reducing single use plastic is easier than we think. If you made it to the end, thank you so much for reading. I'd love to hear your thoughts, challenges and successes in the comment section.